Excellent Chip Control and Longer Tool Life. Easy Connection with High Pressure Hose and Joint. 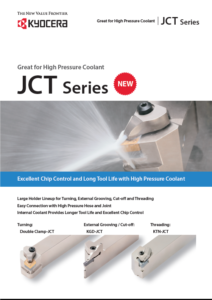 Internal Coolant Provides Longer Tool Life and Excellent Chip Control. Large Holder Lineup for Turing, External Grooving Cut-off and Threading.